1. Line the bottom of the oven with foil then preheat the oven to 200°C, gas mark 6. Place the aubergine and pepper directly on an oven rack and roast for 40 minutes. Remove the pepper leaving the aubergine to the oven for a further 20 minutes. Remove and leave both to cool slightly. 2. Remove the skin, stalks and seeds from the pepper and set the flesh aside. Halve the aubergine, scoop out the flesh, and leave to drain for an hour in a sieve. Roughly chop the aubergine in a blender or by hand, then gently mix in a bowl with 1 tbsp onion marmalade and the flour, oregano, cumin and egg to make a batter. 3. Blend the remaining onion marmalade with the peeled pepper, vinegar and 3 tbsp pine kernels in a food processor or blender. Season and set aside. 4. Warm 1 tbsp oil in a non-stick frying pan over a medium heat. Place 1 heaped tbsp of the aubergine batter into the pan and spread from the centre to make a 12cm pancake. Cook for 1-2 minutes on each side, until golden. Repeat to make 4 pancakes. 5. Return the pan to the heat. Rub the lettuce quarters with the remaining oil and cook for 1-2 minutes, turning occasionally, until slightly charred. 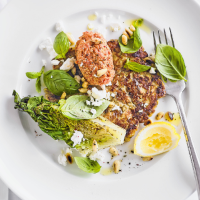 Serve each pancake topped with some red pepper mixture, a lettuce quarter, crumbled feta, some of the remaining pine nuts and herbs, with a lemon wedge to squeeze over.